It’s November and time to start thinking about Christmas gifts. One of my favorite type of gift to give is something handmade. There’s just something special and meaningful about a gift you make yourself. I’m a knitter and just recently started doing a little bit of sewing as well. I love to craft, cook and bake, so handmade gifts are always a great option. A Note Of Caution – Not everyone appreciates handmade gift. While many love that you sat down and created something unique for them, spending lots of time on it and thinking about them while you make it, others don’t think about handmade gifts the same way. I guess it depends on how you grew up. If you can get a feel for how the person may react to something you made. Will they think it’s cheap and frugal, or will they appreciate the time you invest in their gift? Let’s hope for the best and assume people will love what you’re making. Here are some ideas to get you started. These are the things I’m either currently working on or things I am planning on making during the weeks leading up to Christmas. Let’s start with something we’re all familiar with. Cooking and baking. Why not make something delicious and give it as a gift. You can tailor food gifts to the person you’re giving it to, or keep it simple. Make some extra cookies this year and pick up a couple of pretty holiday plates at the dollar store. Make up a plate of cookies and take it to a friend, neighbor, colleague or send it to school as a teacher gift. Homemade convenience foods are another great option. I have a big list of recipes here. I love making the beverage mixes as gifts. 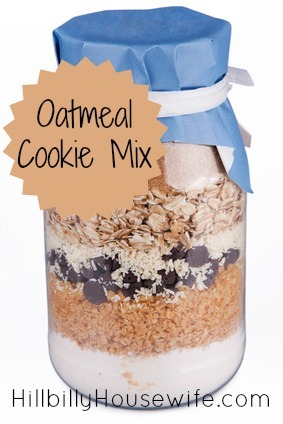 Put them in a mason jar, add a ribbon and a little card with instructions on how to use them and you’re good to go. Of course you could also bake a pie or a cake. How how about making a couple of freezer meals for a new mom and taking those as a gift to give her more time to enjoy the holidays with her loved ones. The possibilities with food gifts are pretty endless. 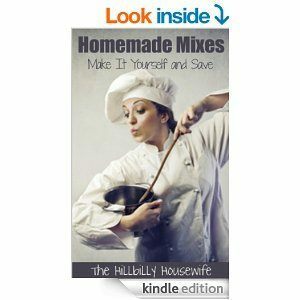 If you don’t want to give actual food, or have to mail things, why not collect your families favorite recipes and putting them into a little homemade cookbook. If you’re into scrap-booking and photos, add some pictures of your kids when they were young, or everyone gathered at the holiday table. 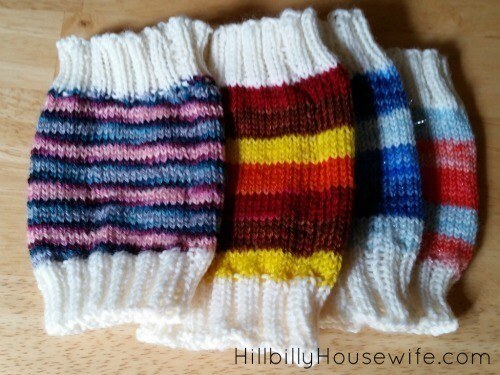 Since I enjoy both knitting and crochet, I’ll be making a few gifts this way. My German side of the family loves hand-knit socks. I’m working on the last two pairs before mailing those off. With a little luck, I can get the package sent out before Thanksgiving, which would be nice. Even if you aren’t an expert knitter or crocheter, it’s easy to pick up some needles and yarn at your local Walmart and make a few things. Or look around the house and see what yarn you have leftover from other projects. This year, I’m making dish clothes and coffee cozies along with some socks and hats. I thought I’d share the patterns I’m making. They are quick and easy and make cute last minute gifts. 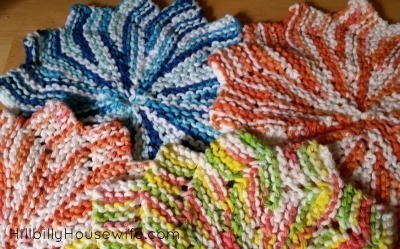 I sat down and crochet a whole stack of these cute star shaped dish cloths over the course of a weekend. They are quick and easy to make. The pattern is available free here on the Lions Brand website. Make a few of them and tie them up with a ribbon. They make great dish cloths, but also wash cloths. Pair them with a bar of handmade soap or a beauty soap bar from the store for a quick and easy gift. 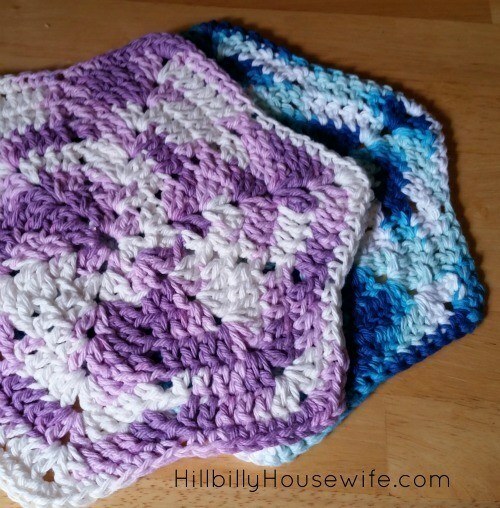 While I love how quick it is to crochet a dish cloth, I personally prefer the fabric of knit ones. I loved the round-ish shape and looked for a good knit pattern. I found the Almost Lost Dish Cloth pattern and started making some of those as well. Don’t they look pretty and colorful. I just picked up cotton and creme thread at my local craft store in a few different colors and started knitting them up. Each small skein of yarn was enough to make two large dish cloths. By the way, if you’re a Homemaker’s Hutch Subscriber, I’ve been sharing a different dish cloth pattern each month since the first edition. Browse back through the archive of past issues to find some other types of dish or wash cloths to knit up. When I knit socks, I always end up with a small ball of leftover yarn. I’ve been using up some of that extra yarn in my sock yarn blanket that I shared in the Newsletter. This year I also started making some coffee cup cozies. They make great stocking stuffers or gifts for teachers and friends. You could also knit one up, put it on an empty coffee cup and then put some candy, coffee mix or even a gift card to a coffee shop inside the cup. I wrote up the pattern for my cozy little coffee cozies here. There are all sorts of cute sewing projects you can make as well. I’ve been sharing a few of them on the Hillbilly Housewife Facebook page. I plan to make a few infinity scarfs. They look like a very easy sewing project. I’ll try to remember to take pictures and post them here as I make them. Here’s the pattern I plan on using. I’ve been getting a lot of project ideas from the SewCanShe Blog. Of course you don’t have to stop with those three crafts. They just happen to be my favorites. If you’re a scrapbooker, make some small photo memory books as gifts for family members. If you’re a photographer, find a few of your favorite shots and print up custom cards. Or have a pretty photo printed on canvas and frame it. If you can make something pretty, go for it. I get a lot of creative ideas from the Crafts by Amanda Facebook Page and Blog. And then there’s the ABCs of Christmas giving, a resource put together by HBHW readers a few years ago. It has some very cute homemade Christmas gift ideas in it. Last but not least, let’s not forget about the gift of time. Take your mom out for lunch. Meet up with the girls for a night of wine and chatting. Rent a movie, make some Pizza and have the nieces and nephews over for dinner and a movie. Offer to clean house for your friend with the new baby. You get the idea. My best piece of advice for homemade gifts is to start early. Do as much as you can well before December 1st. It always gets busy during Advent and homemade gifts tend to take longer to make than you anticipate.